This article will examine terms of art used in a Chapter 11 cramdown. These terms go hand in hand during a contested or cramdown hearing. The court will work to assure that the bankruptcy definition of these terms is met before confirming a plan. Any expert expecting to testify at a cramdown hearing should have a working knowledge of their meaning. Terms of art are common in our society. Each field or profession contains words or phrases that have a precise or specialized meaning for them. For those working as a financial expert in litigation, it is no different. Many of the terms of art have been defined through legislation and legal precedent. Any financial expert entering this environment should become aware of how certain terms apply. Chapter 11 is primarily used by business enterprises wanting to continue their operations.1 Under this format, a reorganization plan is proposed to the bankruptcy court. If the reorganization plan is confirmed by the judge, the debtor makes payments directly to its creditors until the terms of the repayment plan are fulfilled. Through the Chapter 11 reorganization process, a debtor may reduce its debt obligations, terminate burdensome contracts and leases, recover assets, and rescale operations, ultimately emerging as a reorganized business with less debt. 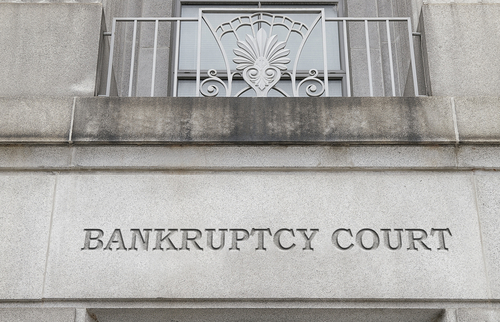 In bankruptcy reorganizations, creditors who have been deemed impaired have the right to contest the reorganization plan. Being impaired means the reorganization plan alters the contractual rights of a class of claim holders. Most often, this means that under the reorganization plan a creditor will not be paid in accordance with the terms of a loan or contract as agreed prior to the bankruptcy. If the plan does not change the rights of a class of claim holders, the court deems the creditors to be unimpaired and to have automatically accepted the reorganization plan. Creditor objections vary from structural issues to the duration and/or interest rate to be paid on a specific debt, the value of the collateral, or if the repayment plan is feasible (i.e., can the debtor fulfill the repayment obligations). Should an impaired creditor file an objection (e.g., requesting a greater interest rate on a debt to be repaid over time), a court hearing is held in which the debtor and creditor argue their positions. These contested hearings are often referred to as “cramdown hearings” because the debtor is asking that the terms of the reorganization plan be upheld and crammed down the creditor. Not all bankruptcy reorganization plans are contested. However, when an objection is filed, the cramdown hearing becomes very important. This is because the results of the hearing will, more likely than not, determine whether a reorganization plan will be confirmed or denied. A plan unfairly discriminates if one class of equal rank and priority receives payment of greater value under the plan than another objecting class without reasonable justification. The reorganization plan may provide for different treatment for classes of equal rank and priority as long as the different treatment is not deemed unfair. It is the judge who decides if the reorganization plan unfairly discriminates or not. The Bankruptcy Code calls for the “fair and equitable” treatment of any impaired dissenting class. To be fair and equitable, the creditor must not be compelled to accept less than full compensation for its claim while a more junior creditor or interest holder receives compensation or retains interest in the debtor. The language of the Bankruptcy Act provides the language for what is fair and equitable treatment of an impaired creditor. The language means a plan can be confirmed if the secured creditor receives a lien on the collateral that has been securing the claim and is providing a series of payments which are equal to the present value of the claim. It also allows for the sale of the collateral so long as the proceeds from the sale go to retire the outstanding portion of the claim. Finally, the debtor may swap the collateral for another of equal value or provide some form of security for the repayment of the claim, the indubitable equivalent of the claims. As with determining unfair discrimination, the judge reviewing the reorganization plan decides if the plan is fair and equitable. While judges decide what is “unfair discrimination” and “fair and equitable” without input from financial experts, experts’ insight into feasibility and present value are often a part of a cramdown analysis. When a business in Chapter 11 files a reorganization plan, the court reviews it to insure the plan has a reasonable chance of survival once the plan is confirmed and the debtor has moved out from under the protection of the bankruptcy code. In other words, the plan must be feasible. It must demonstrate that the business will be a viable entity, one that is able to meet its repayment schedule as it moves forward. The first part of a feasibility study in a cramdown situation is similar to one performed on a non-bankrupt company. The analysis should consider the adequacy of the debtor’s capital structure, its earnings power, ability and commitment of management, economic conditions, the current credit markets, and the retention of its clients. In the end, the analysis will determine whether the debtor will be able to have sufficient cash on hand to pay its debts over the proposed repayment period. The study should also consider benefits arising from confirmation of the plan. This may include improving profitability by increasing revenue or reducing expenses and/or eliminating unprofitable products or services. Finally, the expert needs to be aware of why the company is in bankruptcy. This could be due to external factors (e.g., increased competition or product obsolescence), internal factors (e.g., poor management or undercapitalization) or a combination of both. These factors play an important role in assessing the ability of the debtor to move out of bankruptcy, operate profitably, and repay its debts as scheduled in the repayment plan. One of the most common assignments given to financial experts in Chapter 11 cramdown matters is determining the appropriate interest rate to provide for the present value of the impaired creditor’s claim. An expert accepting such an assignment must be aware of what “present value” means in cramdown matters. Since 1916, the U.S. Supreme Court has noted the “time value of money” and the need to discount future losses to present value. “So far as a verdict is based upon deprivation of future benefits, it will afford more than compensation if it be made up by aggregating the benefits without taking account of the earning power of money that is presently awarded. It is self-evident that a given sum of money in hand is worth more than the like sum of money payable in the future.”8 The Chesapeake court went on to say that the “safest and best” interest rate should be used for discounting to present value future losses in personal damages cases. 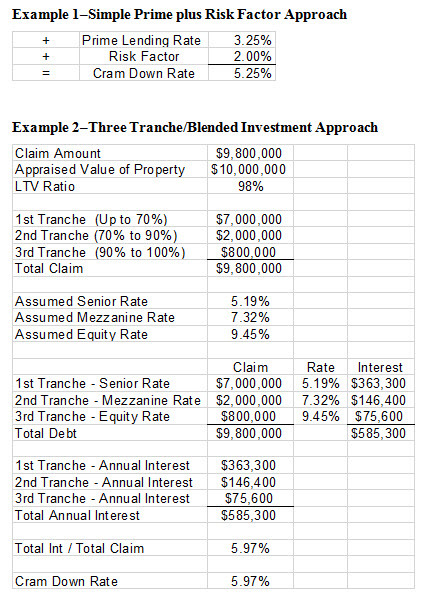 One of the questions often asked of financial experts providing cramdown interest rate testimony is, “Will this interest rate provide for the present value of the secured claim?” Having determined the interest rate and believing it to be appropriate for this payment stream, the expert will always answer, “Yes.” From a financial or economic perspective, the question doesn’t make much sense. However, it provides a view to the nuances in the use of the term “present value” in bankruptcy cases. As noted by the Chesapeake court, “It is self-evident that a given sum of money in hand is worth more than the like sum of money payable in the future.” (Chesapeake, 489) Therefore, it would appear some form of interest should be paid along with the principal in this series of future payments to provide for the amount of the claim as of the effective date. The Supreme Court hoped the wide acceptance of the formula approach would reduce differences over interest rates and what discount rate allows for present value in bankruptcy matters. Of course, that did not happen. A review of methods accepted by courts used in determining the appropriate cramdown interest rate shows great differences in the “time value of money.” Methods accepted by bankruptcy courts have ranged from as simple as applying the Till prime lending rate plus 1% to 3% formula to complex three tranche analyses. Terms of art are found in all professions and fields of work. Chapter 11 bankruptcy is no different. For financial experts working in business bankruptcy, a knowledge and understanding of these terms of art is important. Whether the terms relate to issues to be argued by the attorneys and decided by a judge or more closely tied to the role being played by the expert, greater knowledge of bankruptcy language will assist experts in fulfilling their assignment. Most experts become involved in bankruptcy matters when the reorganization plan is contested by one of the impaired creditor classes. These situations may lead to an expert testifying as a part of a cramdown hearing. Understanding what is expected with a feasibility study or determining an interest rate that provides for the present value of a claim allows the expert to ask the appropriate questions and provide the expected analysis. Also understanding how prior courts have viewed the methods applied by other financial experts adds value to the expert’s work. This article provides explanations for terms of art related to Chapter 11 cramdown situations. These explanations should provide for an initial understanding of the language being used by the attorneys and the bankruptcy judge. Through this understanding, an expert should be better prepared to provide information beneficial to the court and its assessment of the reorganization plan. And through this result, the expert should be able to provide a better product to his or her client. As opposed to being placed in Chapter 7 which calls for liquidating the business’ assets and paying the secured and unsecured creditors with the proceeds. In Re: Adelphia Communications et. al. The Till decision calls for the formula approach to be used in determining the interest rate to be paid to an impaired secured creditor in Chapter 13 cramdown situations. The decision has instructive for Chapter 11 cramdown cases as well. Formula, coerced loan, presumptive contract, and cost of funds are the four methods for determining a cramdown interest rate discussed in the Till decision. See “Commercial Real Estate, Chapter 11 Bankruptcy, Cram Down Interest Rates,” Parts 1 & 2, Quick Read, 5/27/2015, 6/3/2015 for more detailed discussion on determining cramdown interest rates. Allyn Needham, Ph.D., CEA, is a principal at Shipp, Needham & Durham, LLC (Fort Worth, Texas). For the past 18 years, he has worked in the area of litigation support. As an expert, he has testified on various matters relating to commercial damages, personal damages, business bankruptcy and business valuation. Dr. Needham has published articles in the area of financial economics and forensic economics and provided continuing education presentations at professional economic, vocational rehabilitation and bar association meetings. Dr. Needham can be reached at e-mail: aneedham@shippneedham.com, or phone (817) 348-0213.